On top of being one of Hollywood's busiest actors and activists, her mom duty recently doubled. But Kerry Washington insisted she was getting 'enough' sleep at The Critics' Choice Awards on Sunday night. 'You know, the adrenaline gets you through,' she smiled. 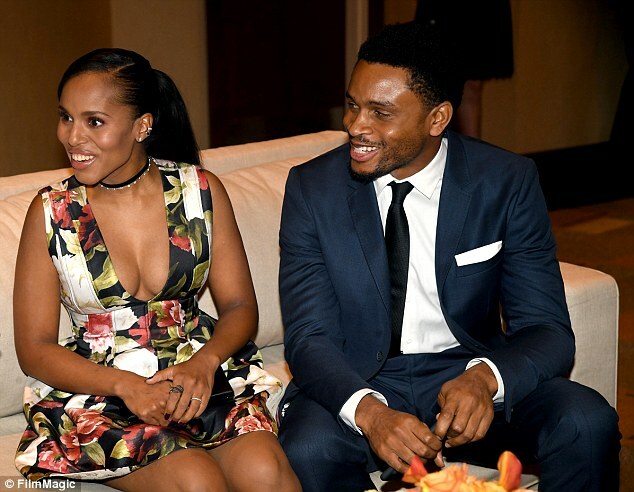 Kerry and her husband NFL player Nnamdi Asomugha welcomed son Caleb Kelechi in October, their second child after two-year-old daughter Isabelle Amarachi. The 39-year-old looked gorgeous on the blue carpet in a short black cocktail dress, flashing lots of cleavage through the sheer star-furnished chest. Kerry is in the running for Best Actress in a Movie/Limited Series for Confirmation, which is also up for Best Movie/Limited Series. The political thriller tells the true story of Clarence Thomas' Supreme Court nomination hearings, in which attorney Anita Hill - played by Kerry - accused him of sexual harassment. Kerry's also excitedly reminded fans that her famous Scandal character Olivia Pope is 'going to be back on TV very soon'. She teased that - just like in real life - the show has a new president too. The actress, who is just as politically active in real life, spoke about the importance of holding politicians accountable, and to remind them they work for us.